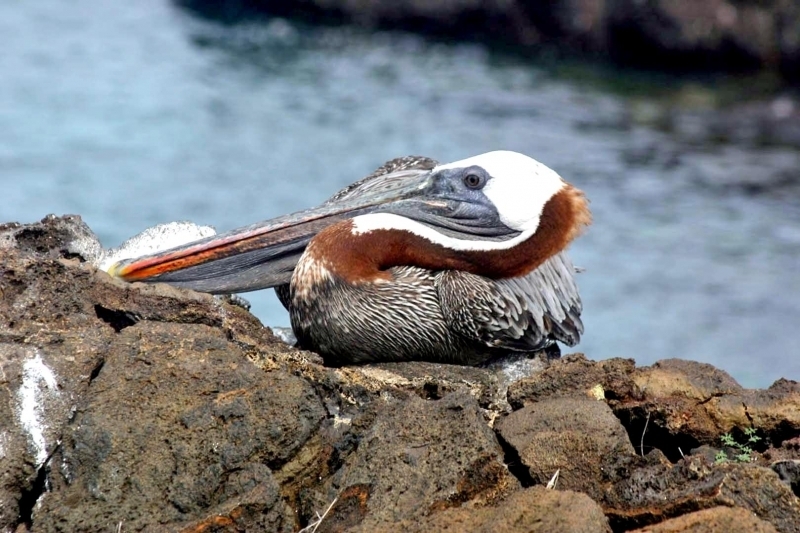 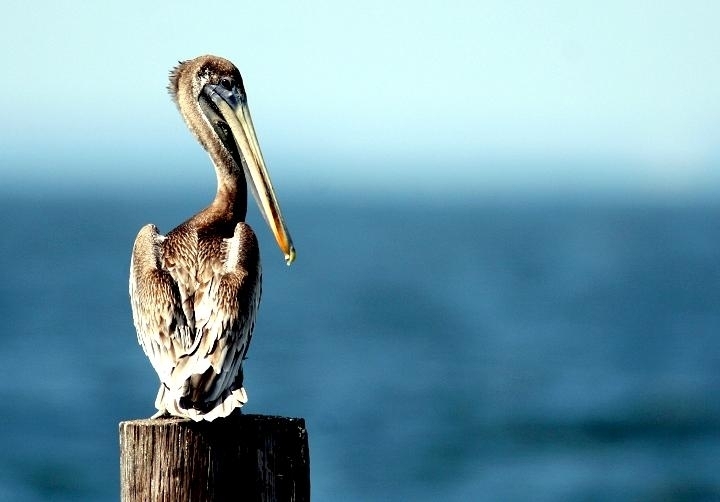 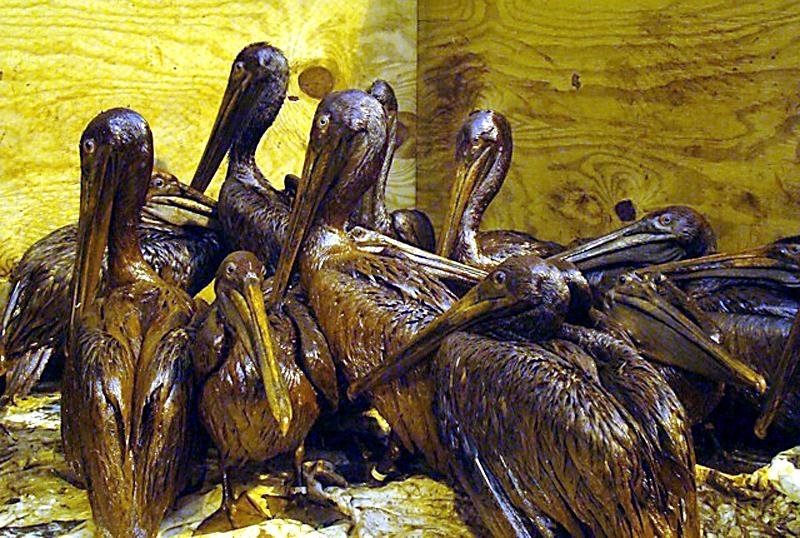 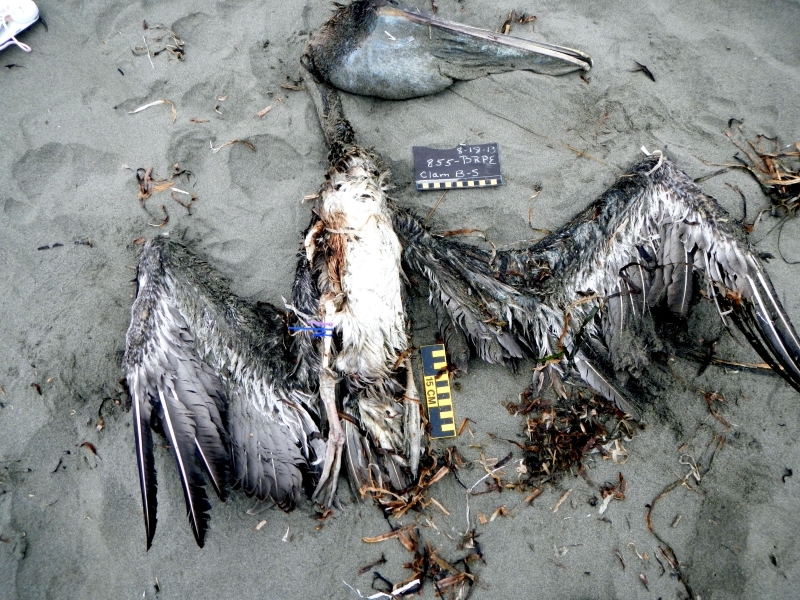 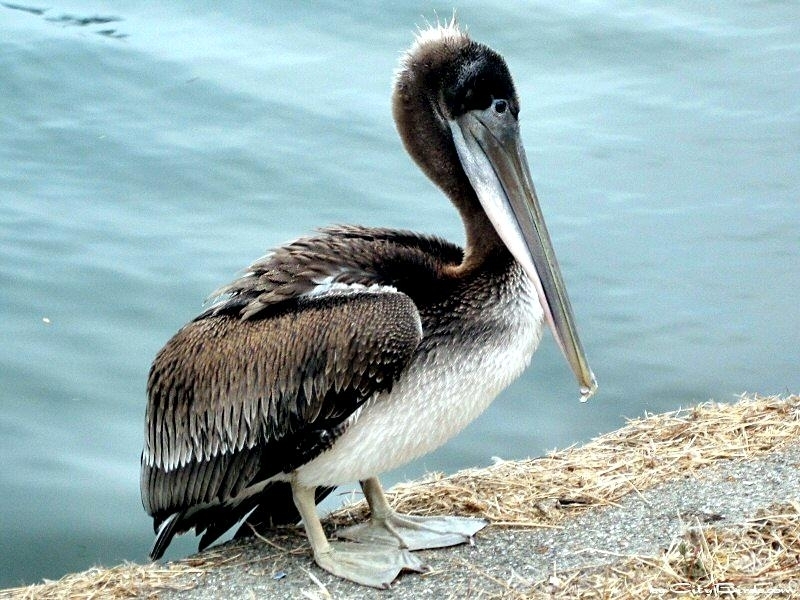 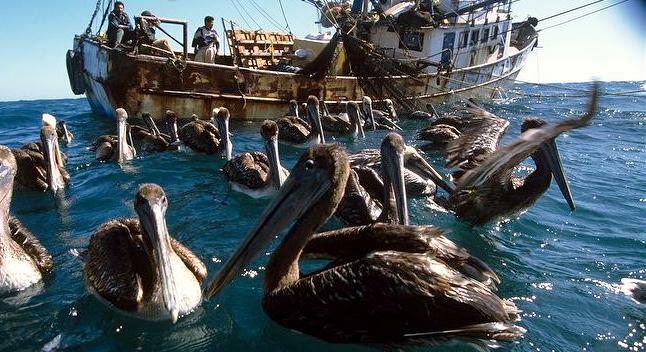 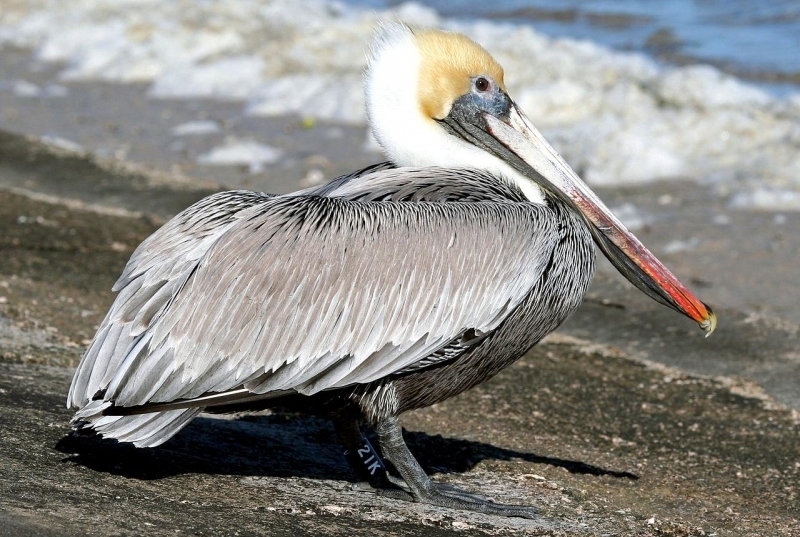 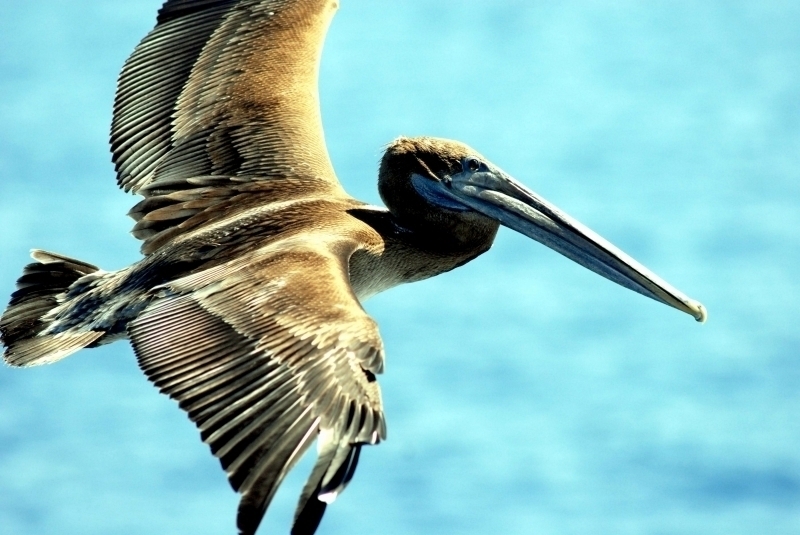 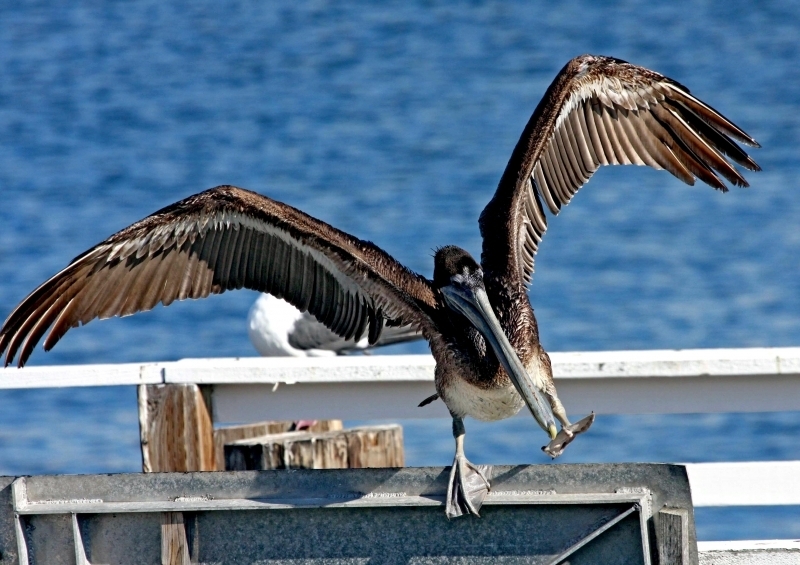 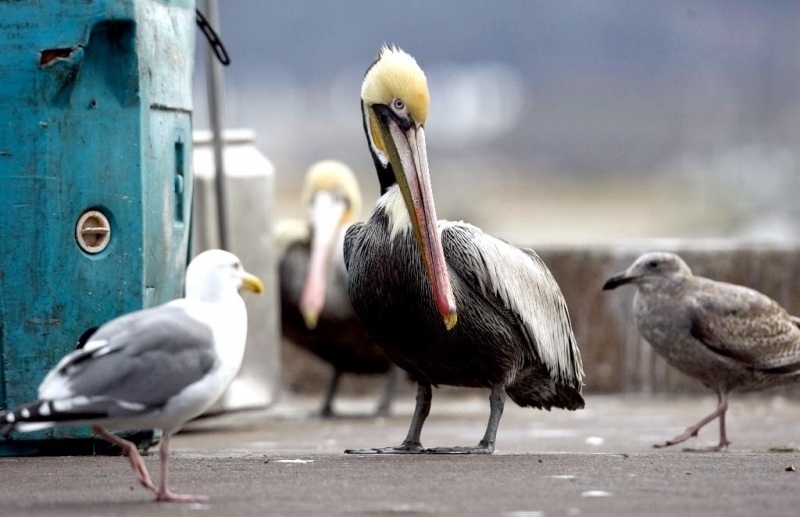 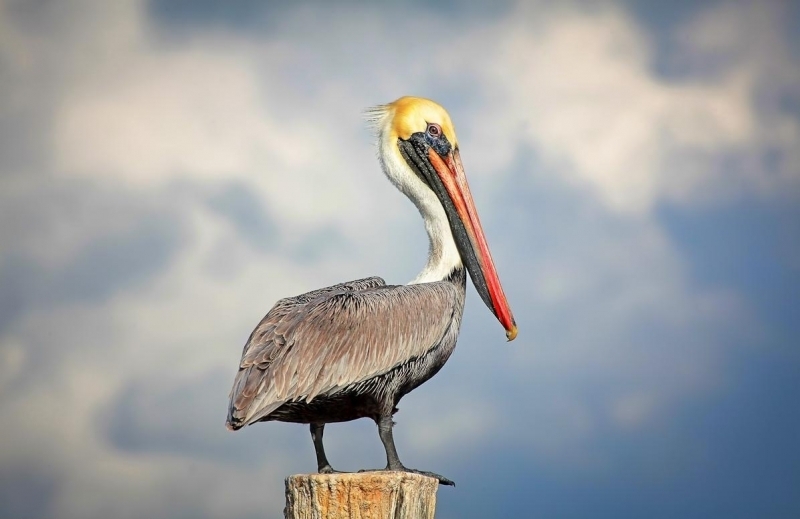 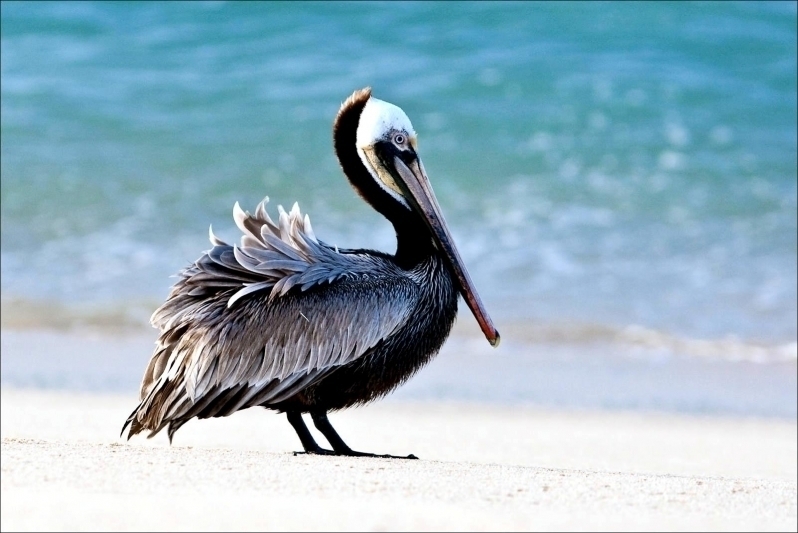 Brown Pelicans are set apart from its brethren by its dark, bulky body about 1.2 meters long. 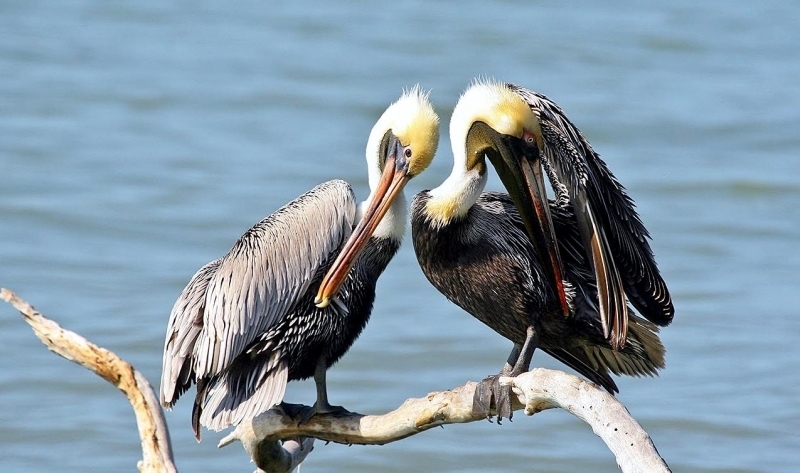 Their head is downy and white with a pale-yellow wash on the crown; their long bill is grayish and their back, rump & tail are streaked with gray and dark brown. 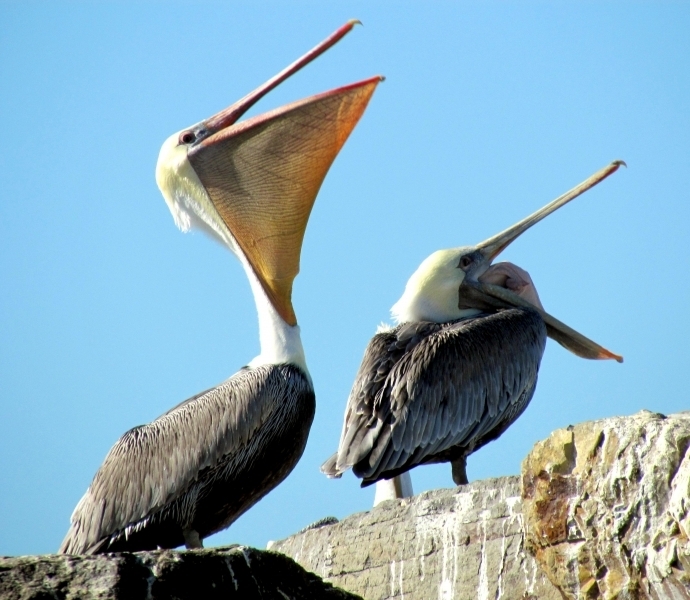 During mating season, their neck turns dark brown. 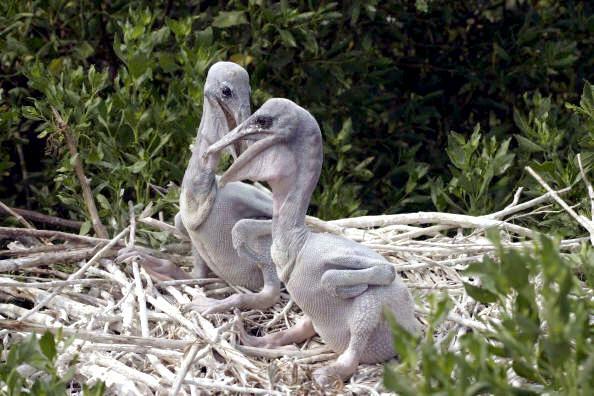 Their eyes are pale yellow and their legs & feet are black. 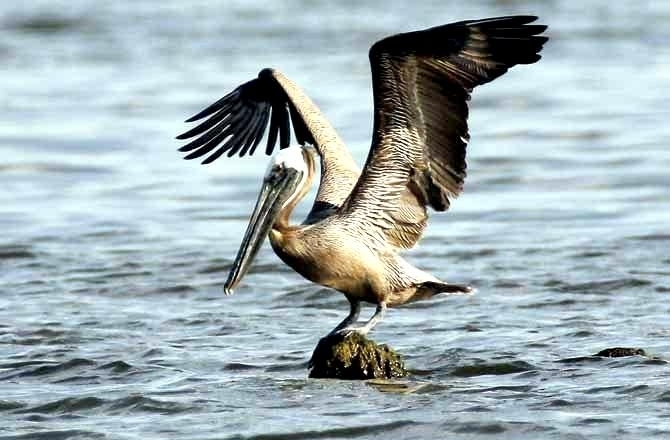 All pelicans and no other birds have a totipalmate foot or one in which all 4 toes including the hind one, are united by a web of skin. 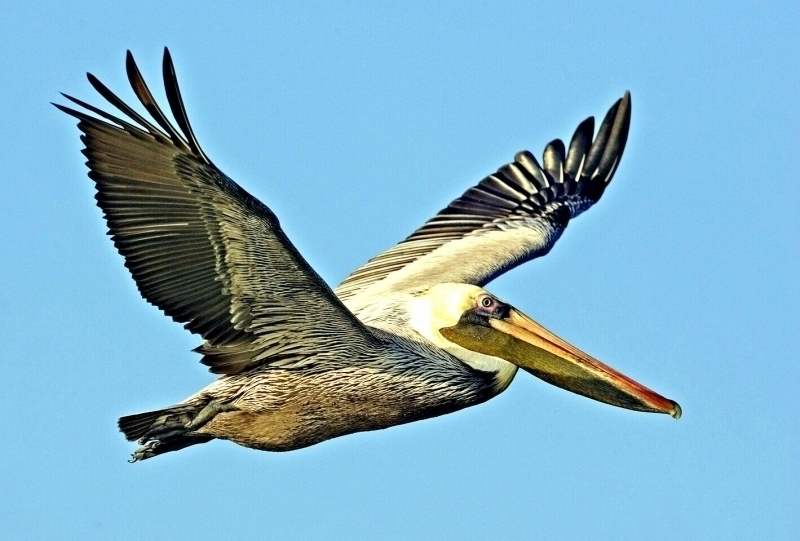 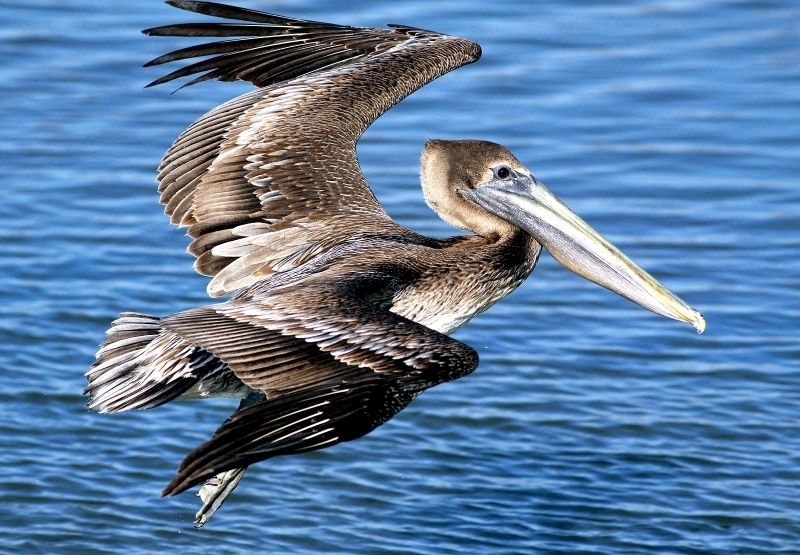 The name “pelican” comes from the ancient Greek word pelekan (πελεκάν), which is itself derived from the word pelekys (πέλεκυς) meaning “axe”. 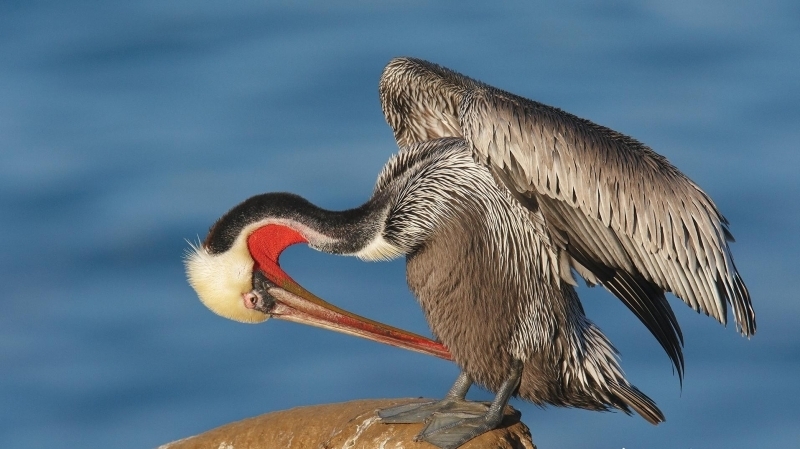 Brown Pelicans also all share a distinctive bill as long or longer than their head, from which dangles a large naked pouch of skin that holds 2-3 times as much as the bird’s stomach about 3 gallons. 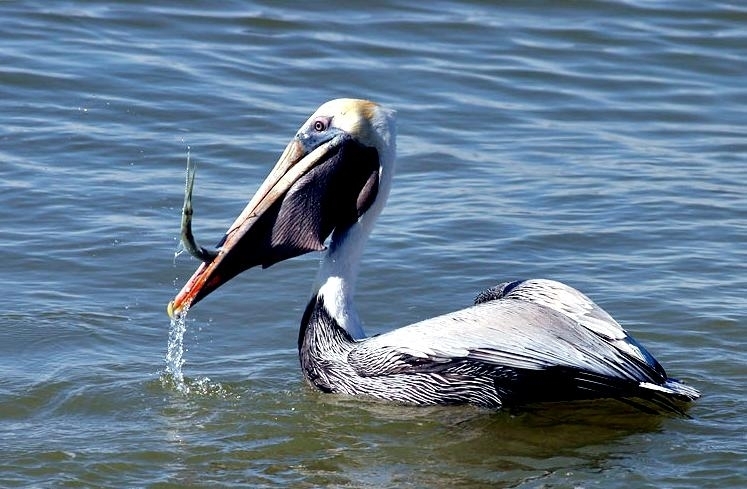 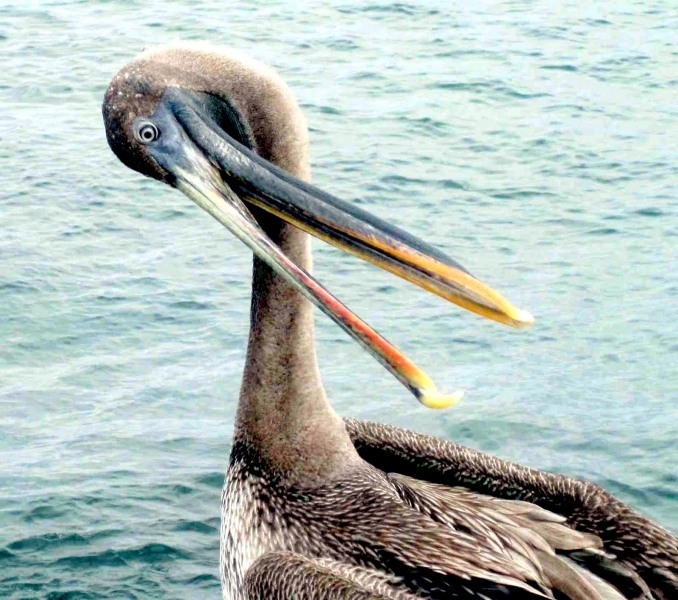 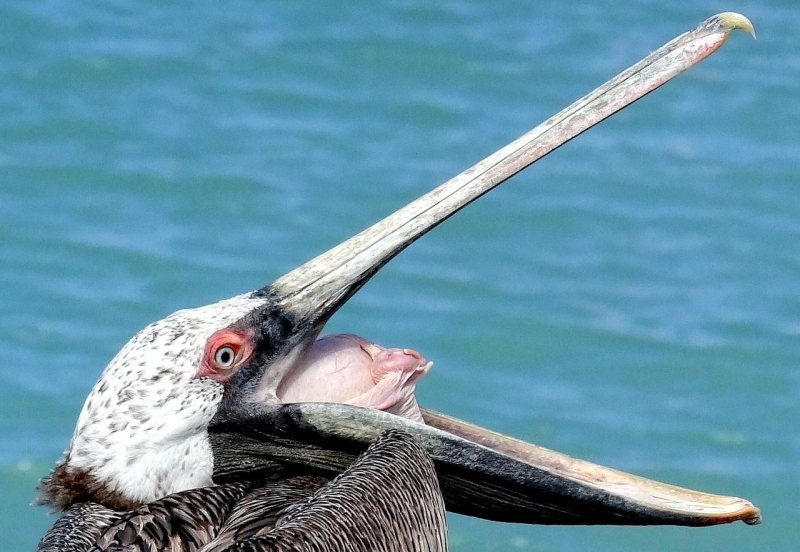 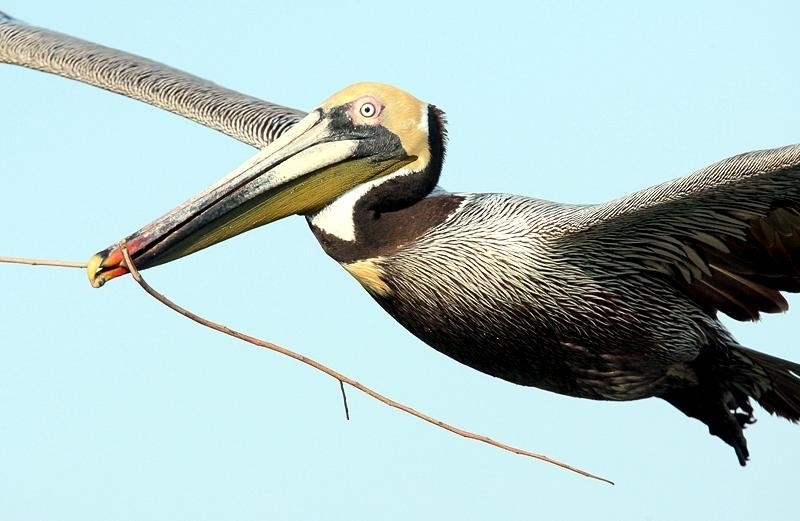 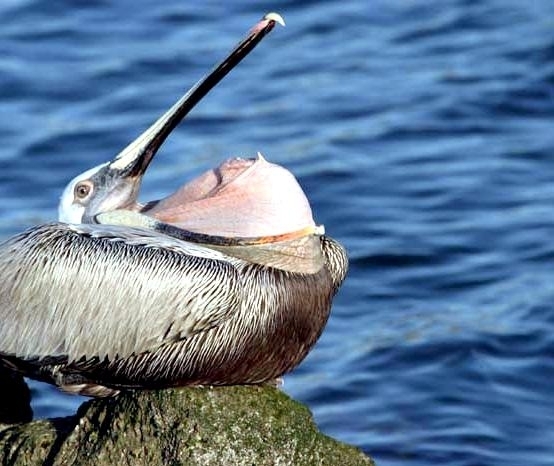 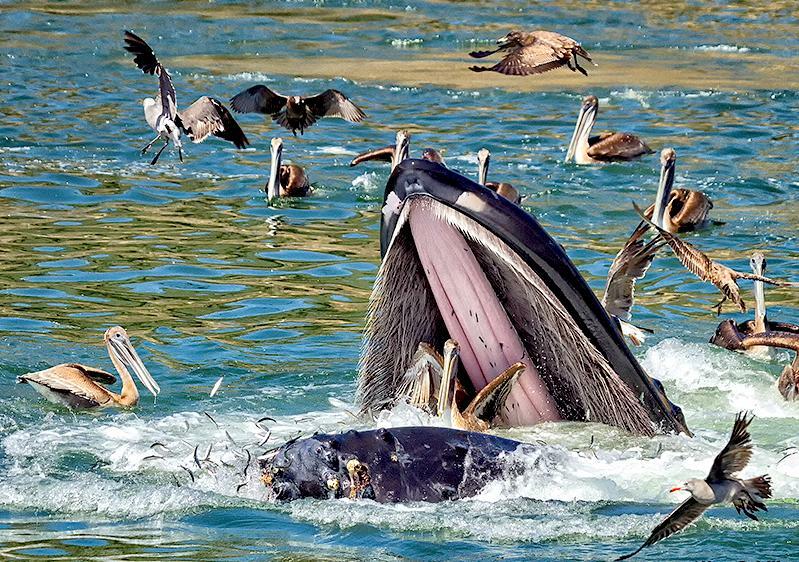 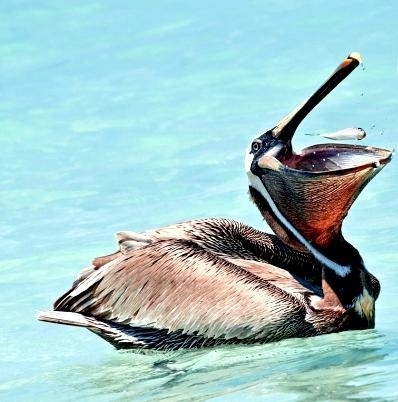 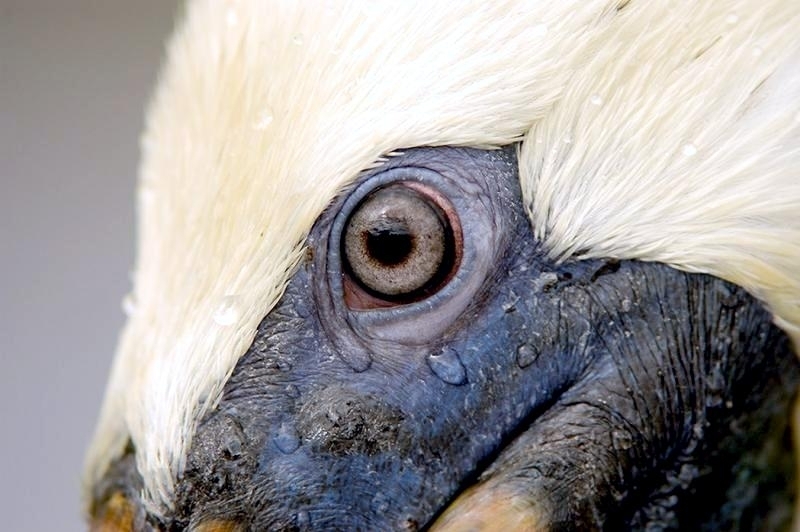 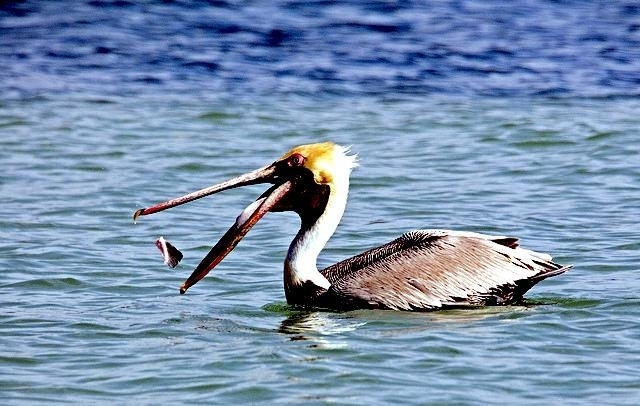 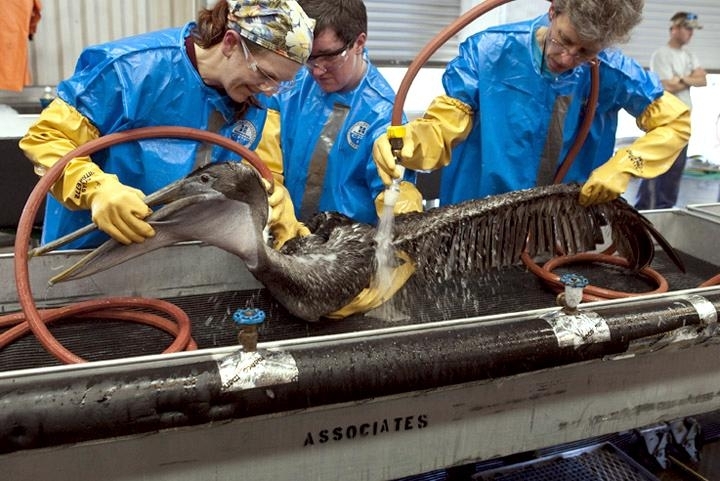 Brown Pelicans let the water drain out of their pouches from the corners of their mouths before they swallow. 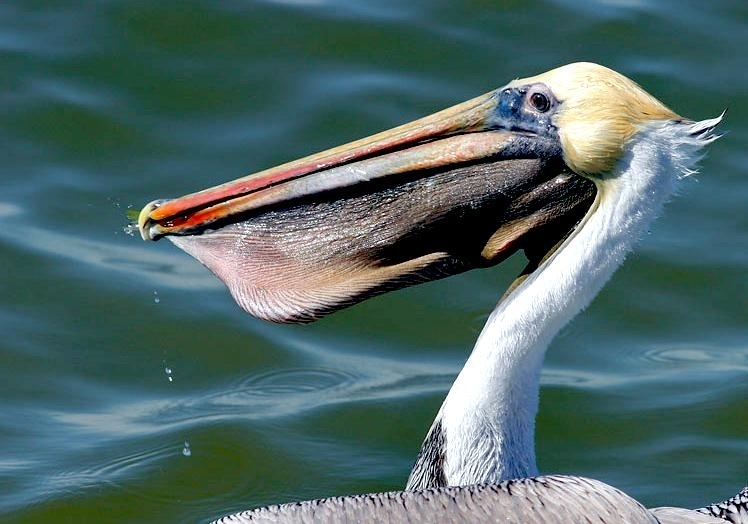 Once they have caught their prey, they will carry it in the esophagus or gullet rather than the pouch. 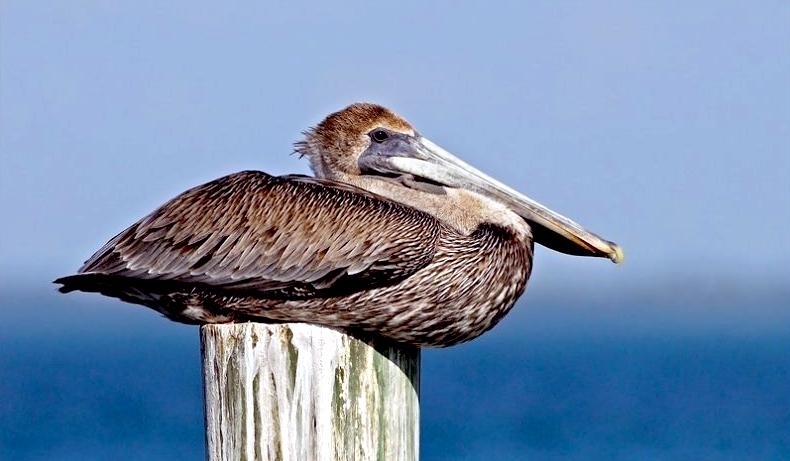 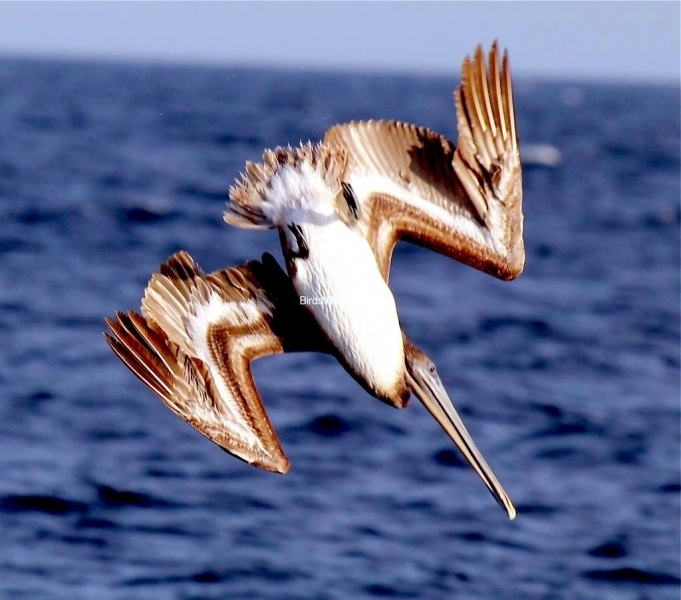 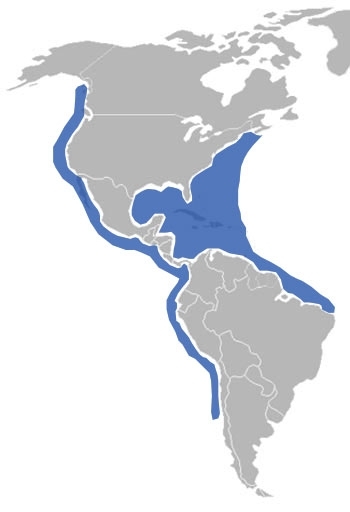 Brown Pelicans are strictly coastal and very rarely seen inland, but they do seem to be flexible in terms of latitude; they are widely distributed along the Pacific, Atlantic and Gulf of Mexico coasts as far north as Nova Scotia, spanning both temperate and tropical waters. 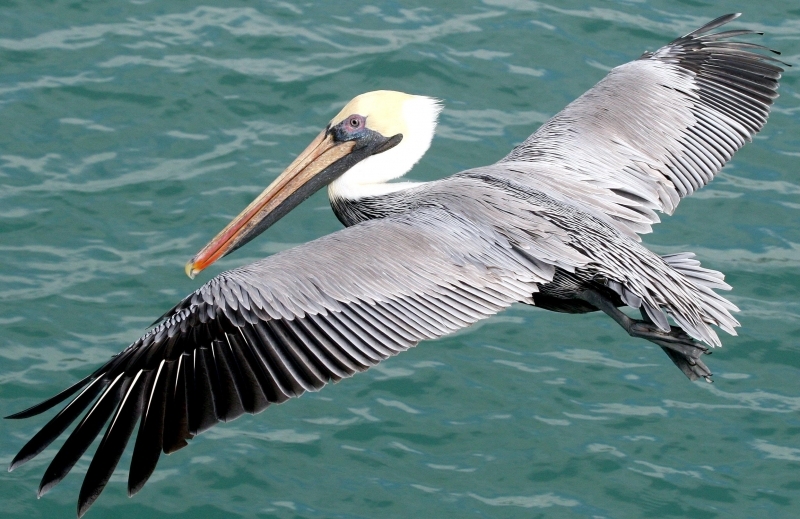 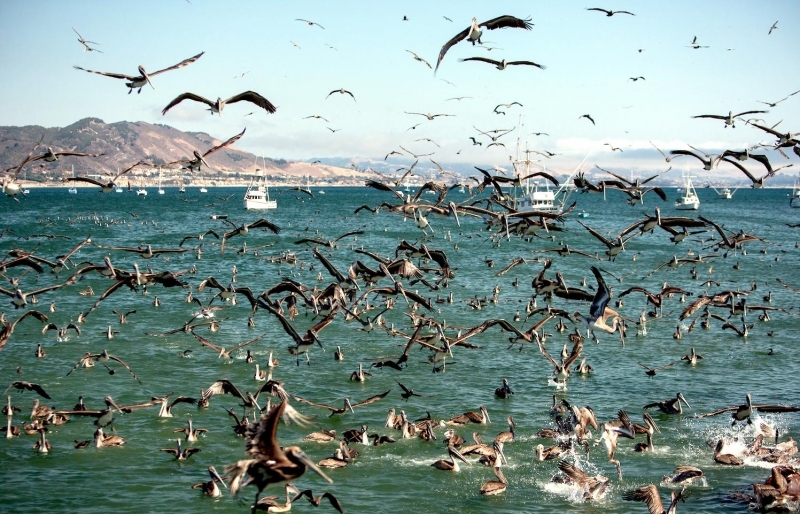 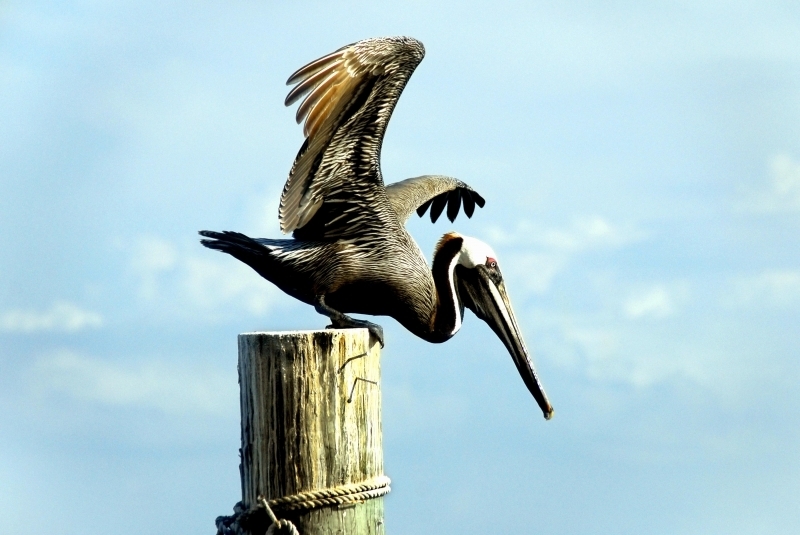 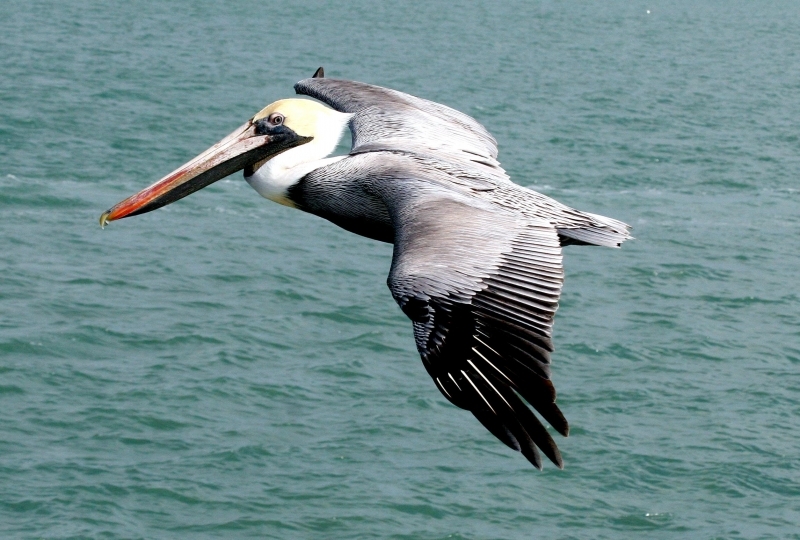 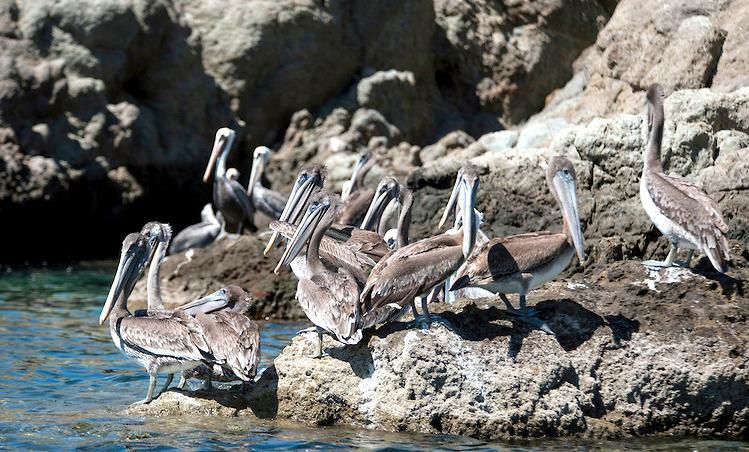 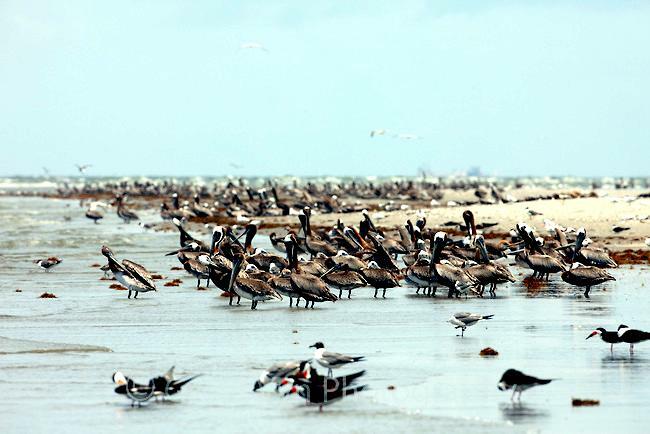 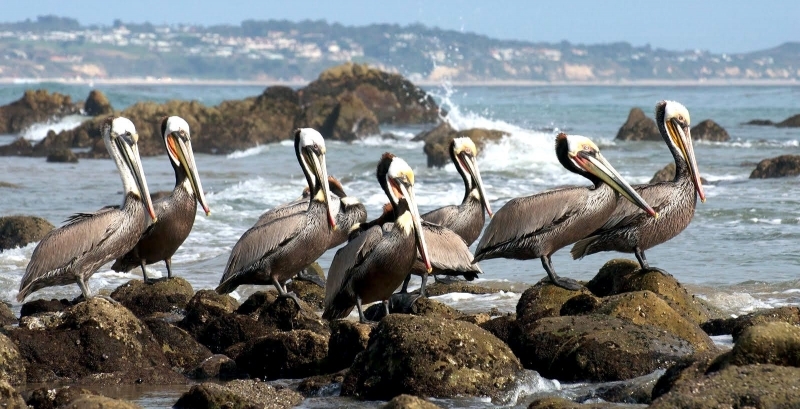 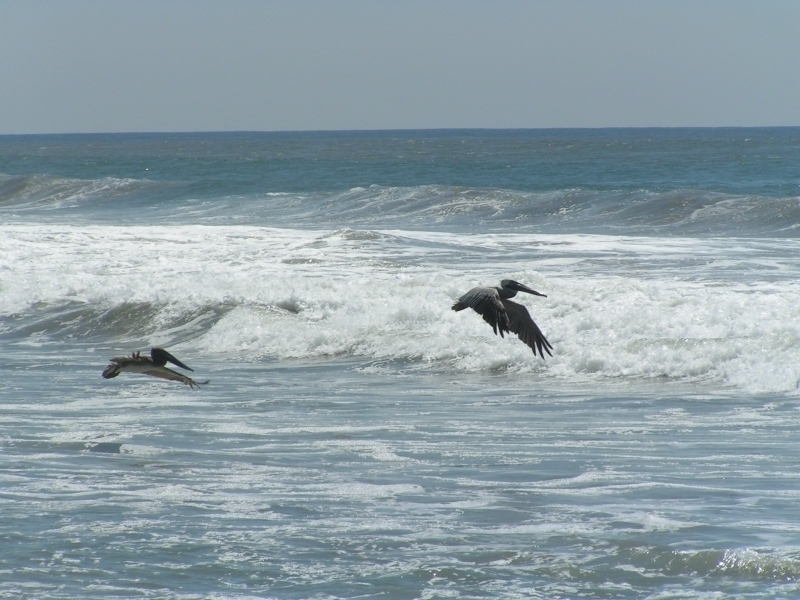 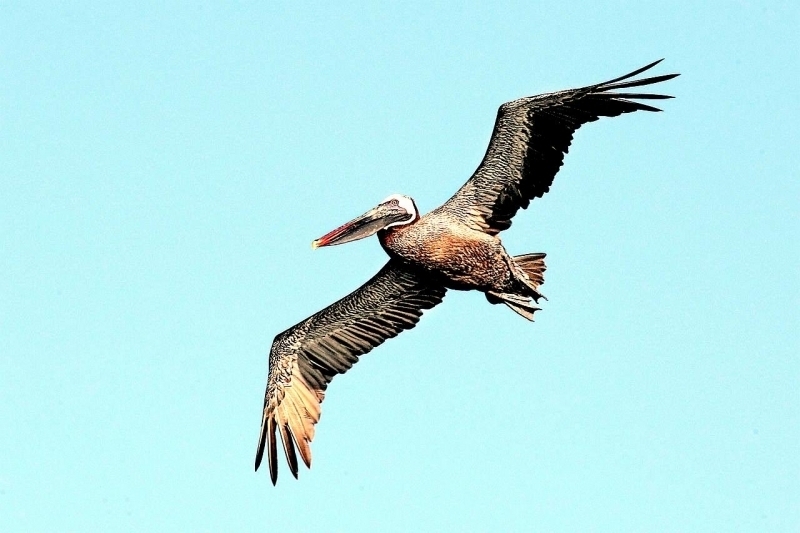 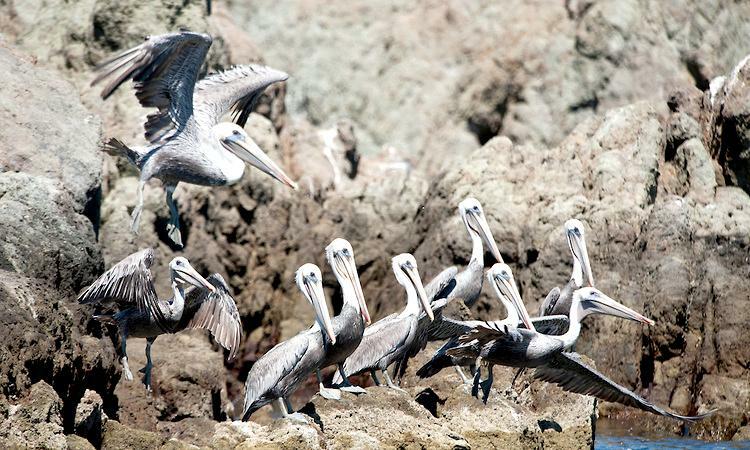 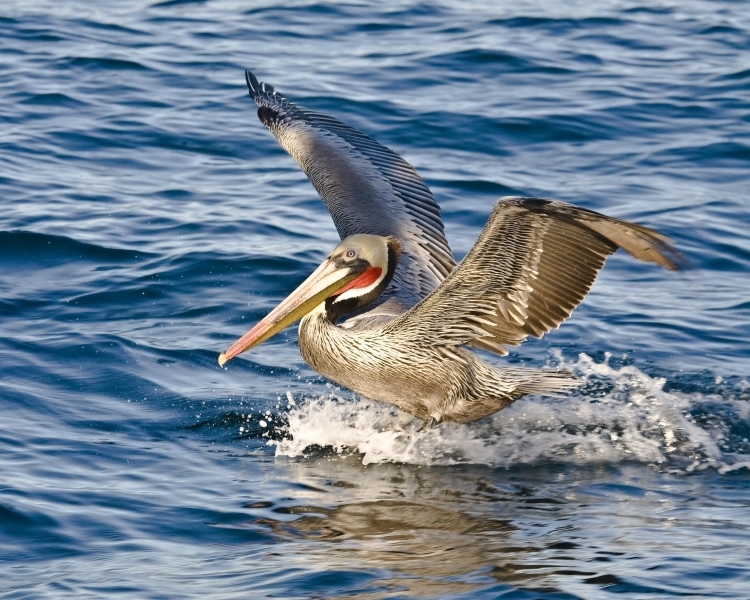 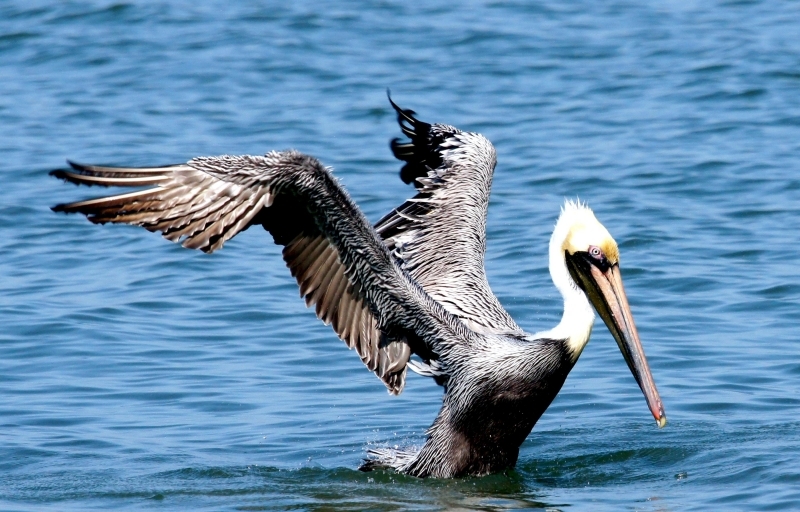 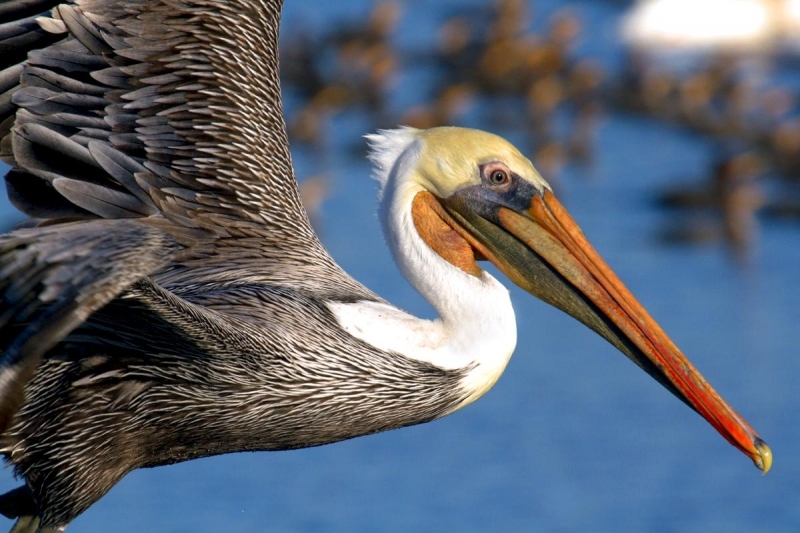 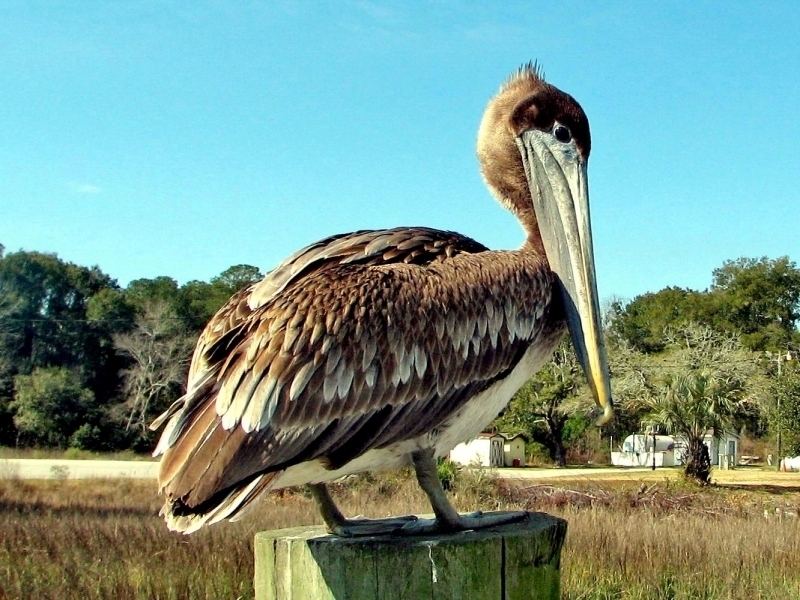 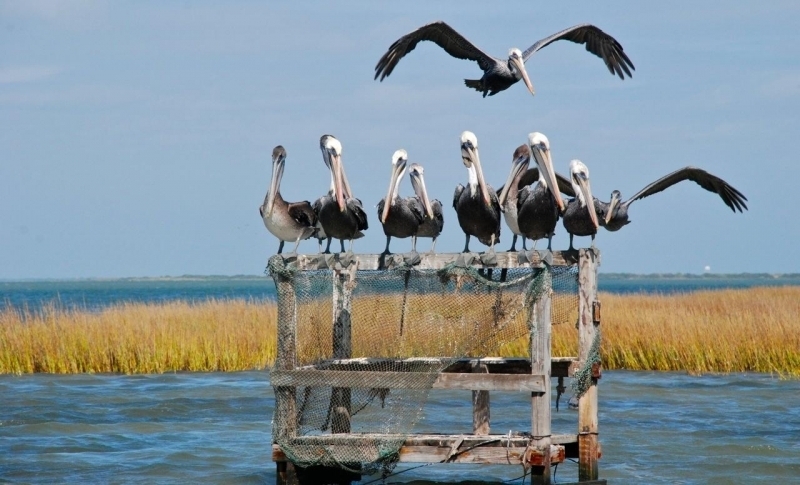 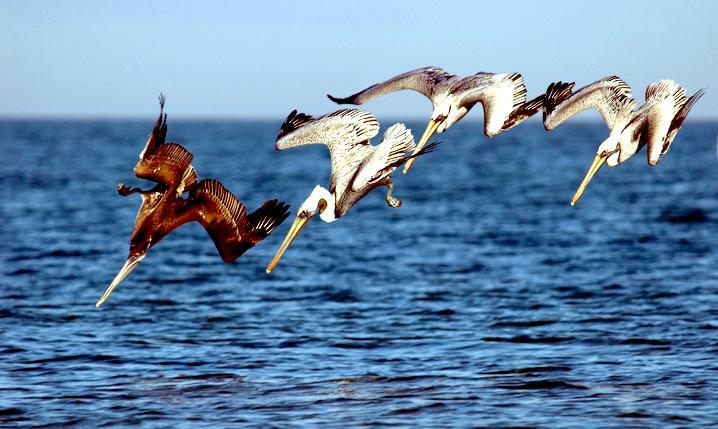 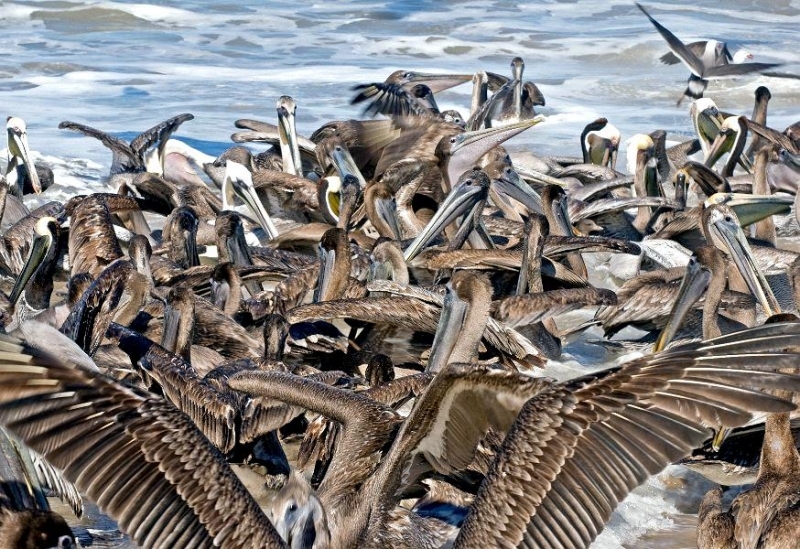 Brown Pelicans are gregarious and live in large flocks throughout the year. 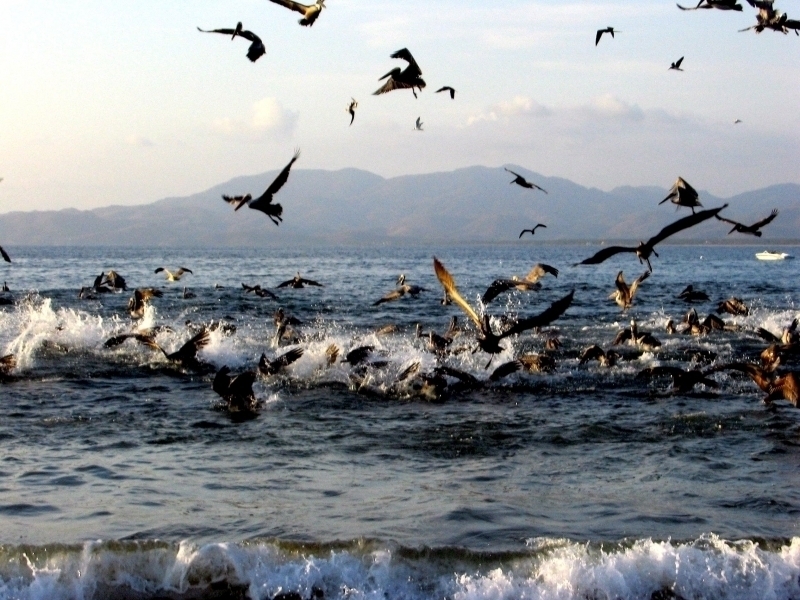 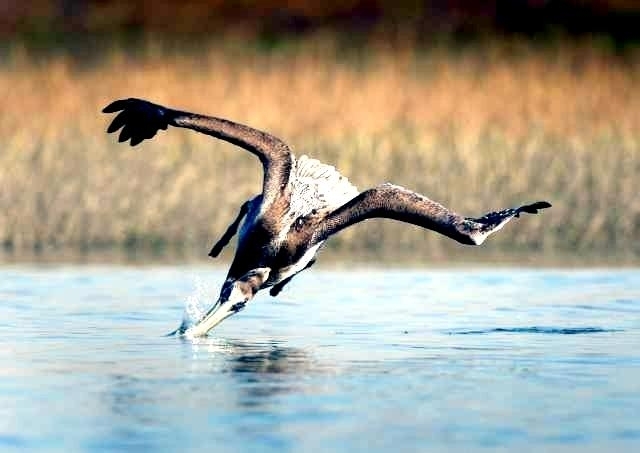 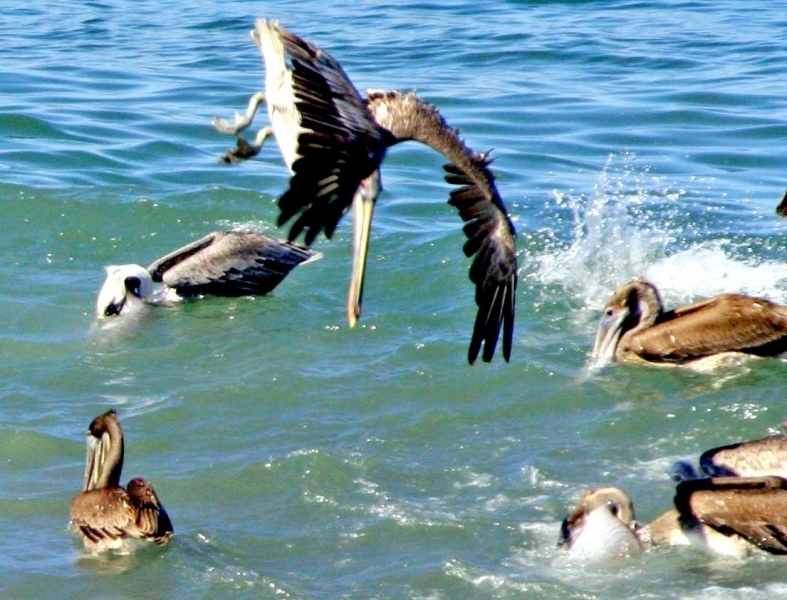 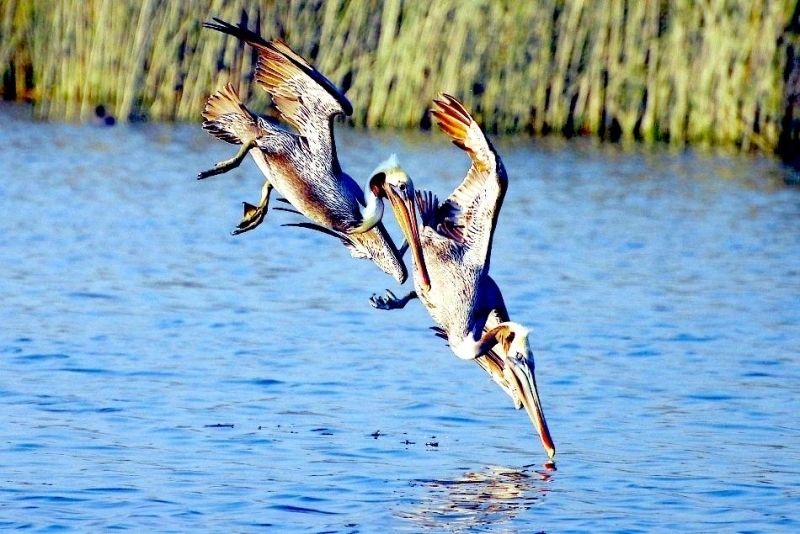 Brown Pelicans search the water for food while aloft, then dive swiftly once they have spotted their prey. 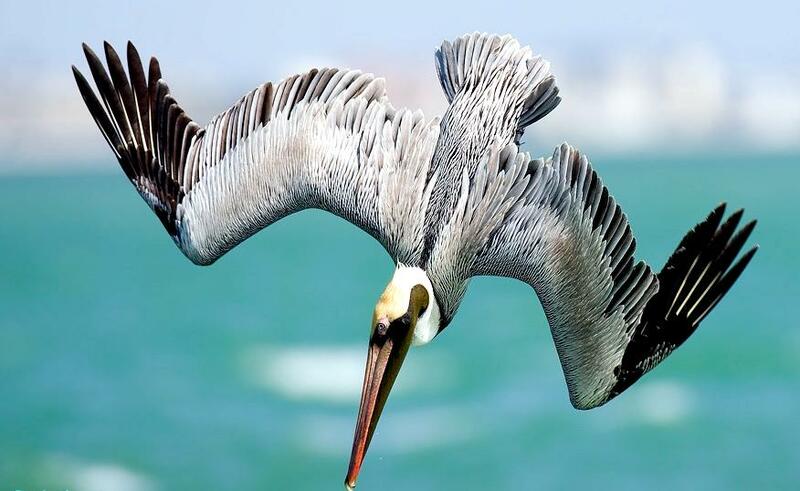 It drops from the air with its wings partly folded and dives into the water and is the only species of pelican to exhibit such behavior. 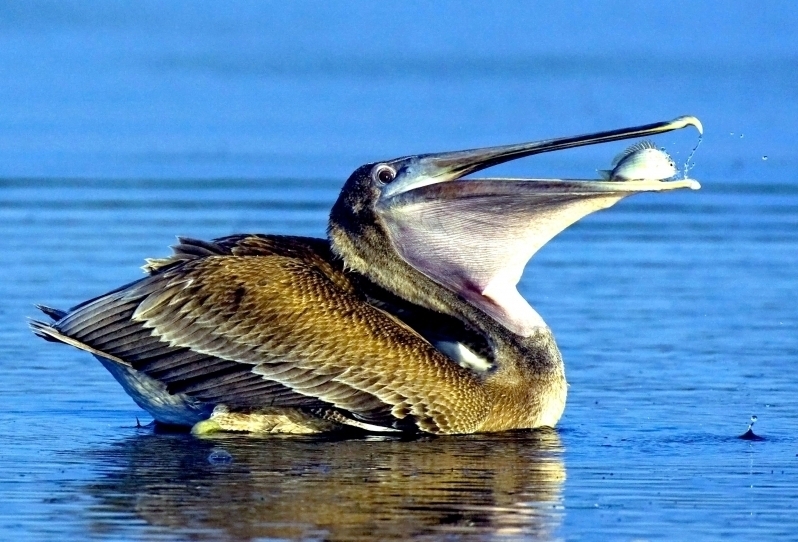 Usually the unlucky fish is a Menhaden, a silvery, highly compressed fish in the herring family which accounts for 90% to 95% of the bird’s diet, but Brown Pelicans are also known to prey on Pigfish, Pinfish, Herring, Sheepshead, Silversides, Mullet, Grass & Top Minnows and they sometimes eat crustaceans usually Prawns. 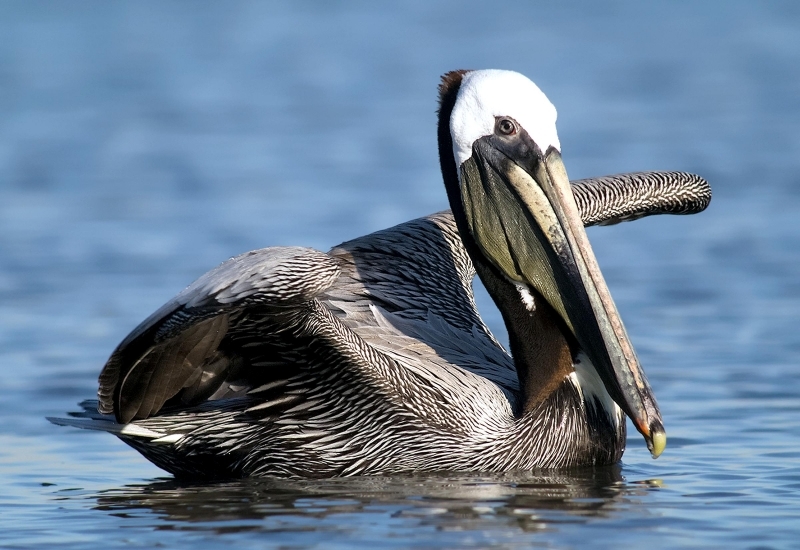 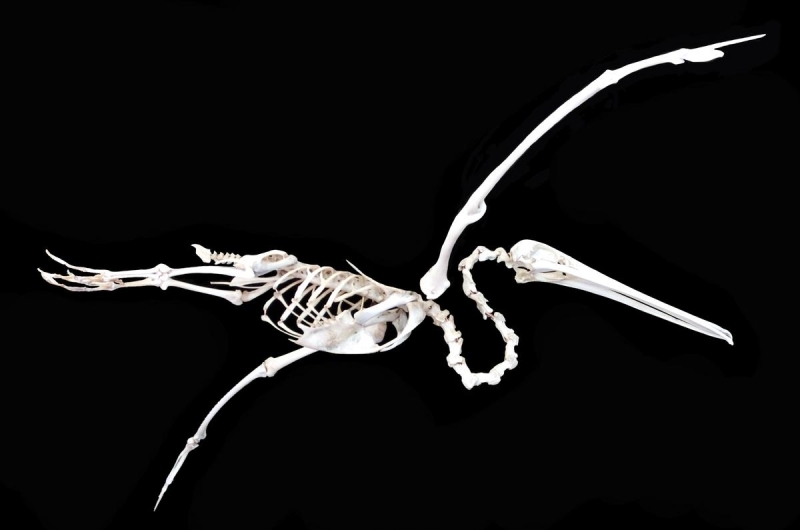 Despite their clumsiness on land, Brown Pelicans are graceful divers & fliers, thanks to internal air sacks beneath their skin and in their bones. 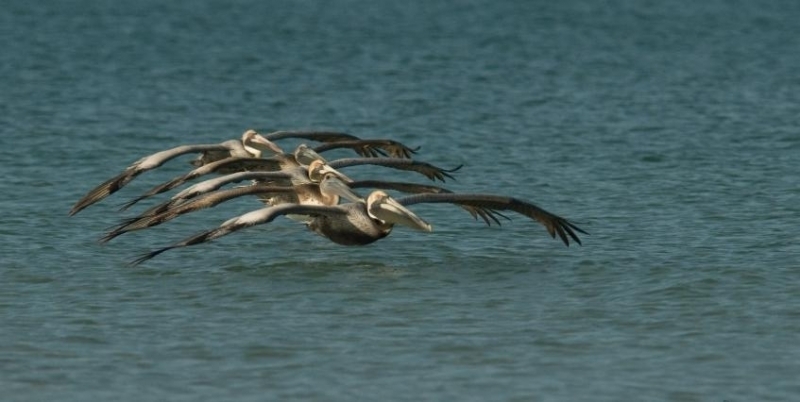 They tend to fly in groups, sometimes in the typical “V” formation but usually in regular lines or single file. 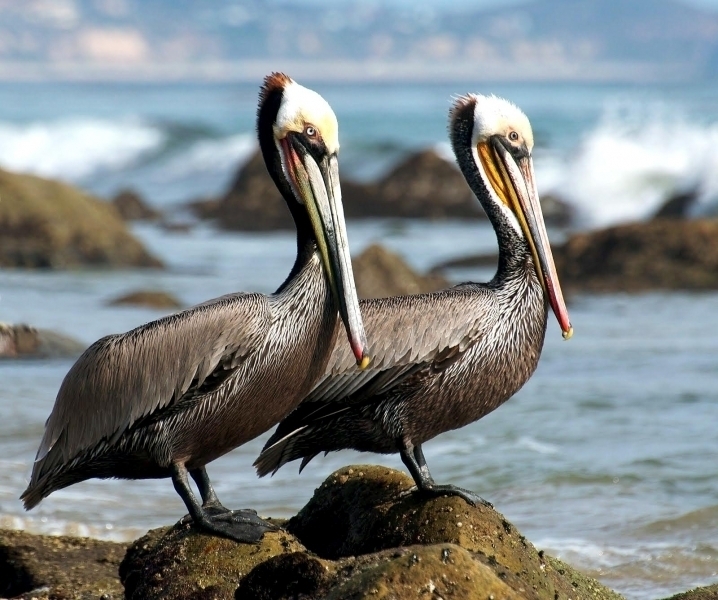 Although Brown Pelicans form pair bonds, they do not seem to communicate with each other very much after mating. 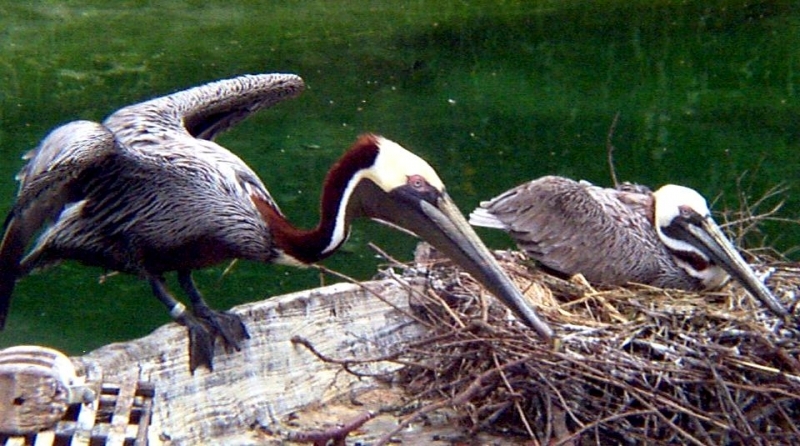 Nesting peaks during March & April when males pick nesting sites, perform an advertising display to attract females and then build their nests. 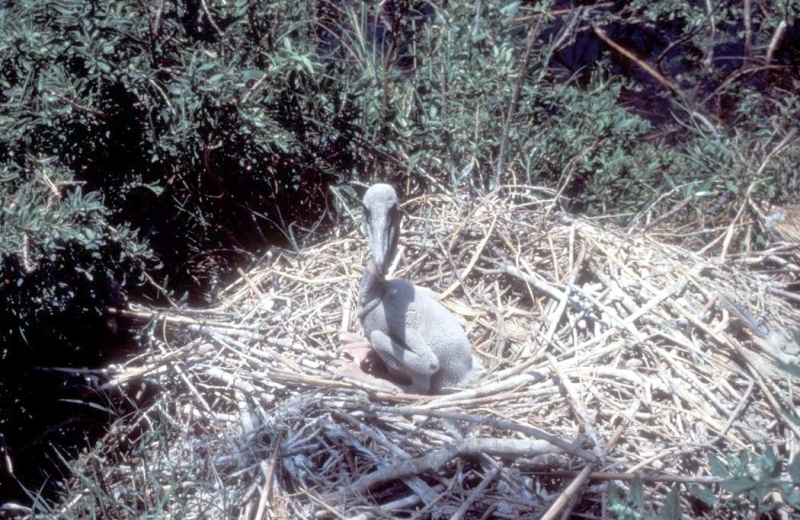 If the nests are built in trees or bushes, they will be made of reeds, grasses, straw and sticks. 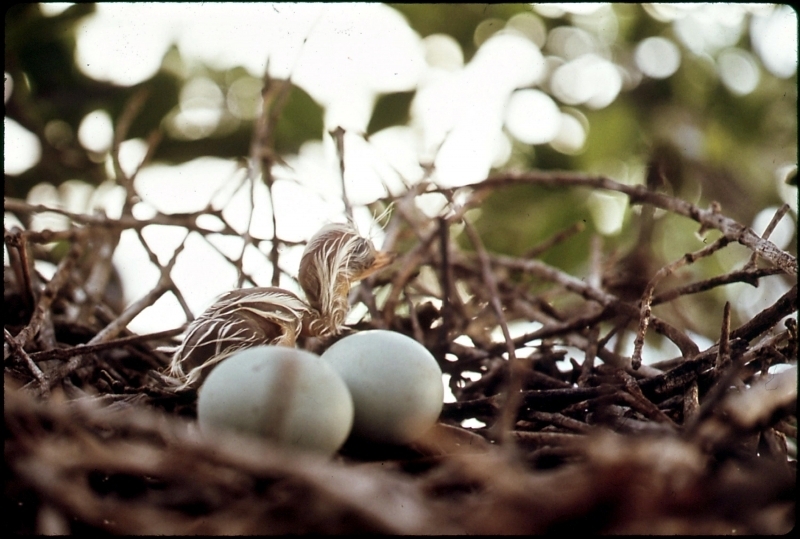 Nests built on the ground consist of a shallow scrape lined with feathers and a rim of soil built a few inches above the ground. 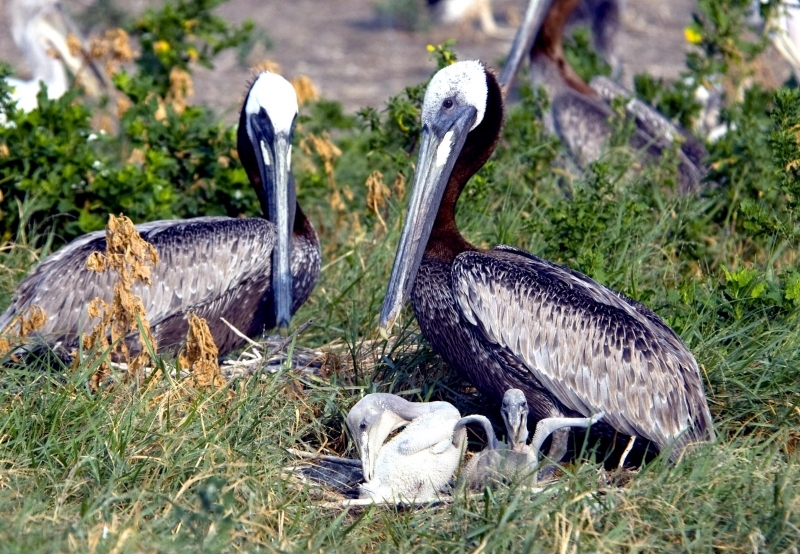 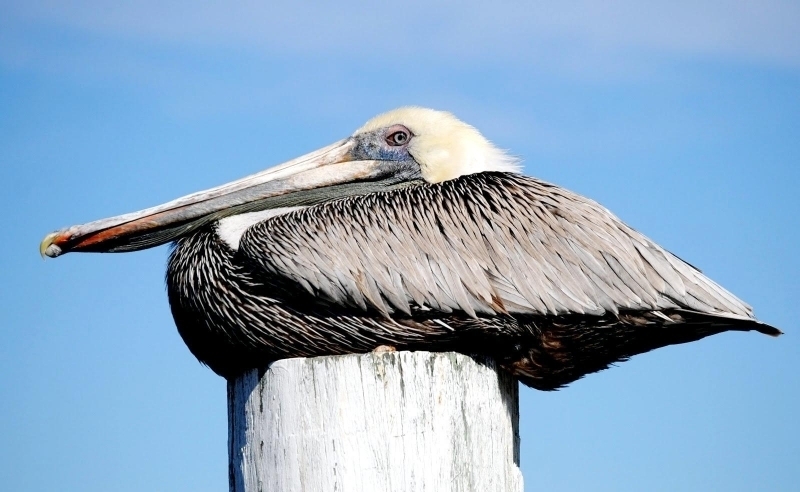 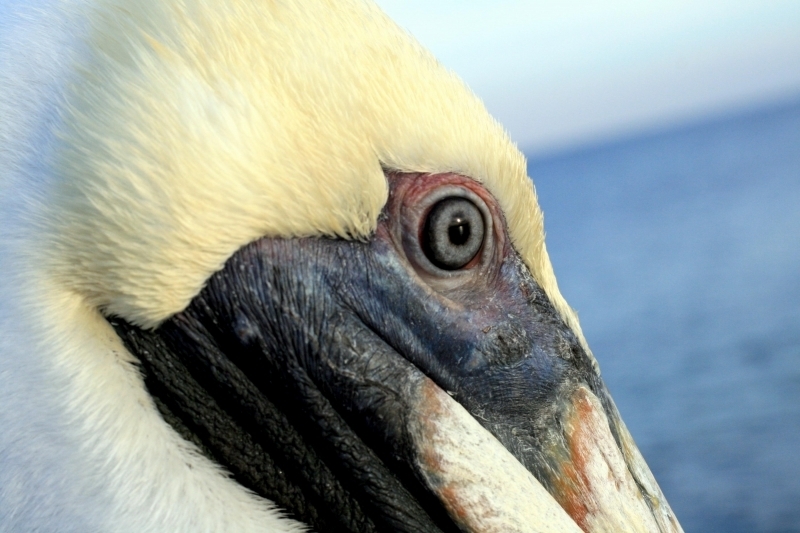 Brown Pelicans lay 2 or 3 chalky-white eggs each breeding season. 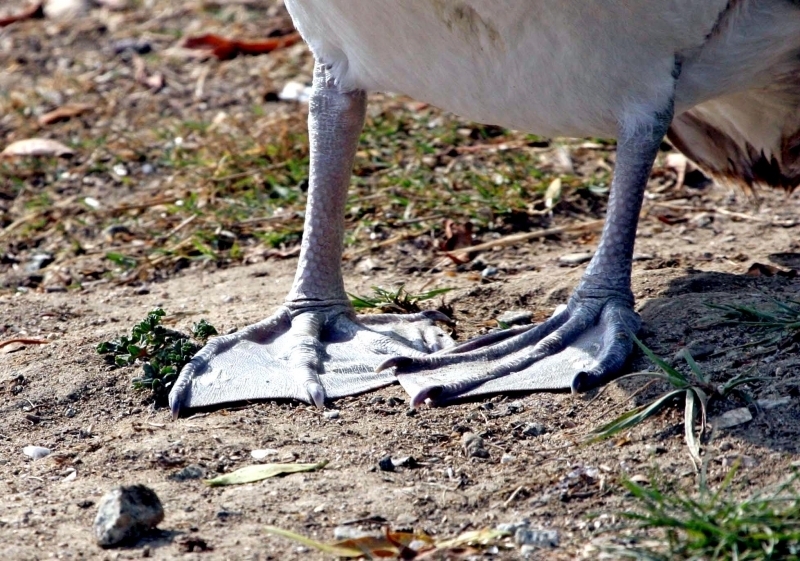 The eggs are incubated for about a month under the parent’s feet. 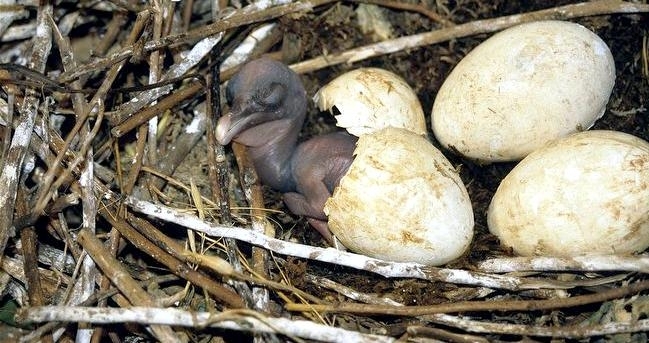 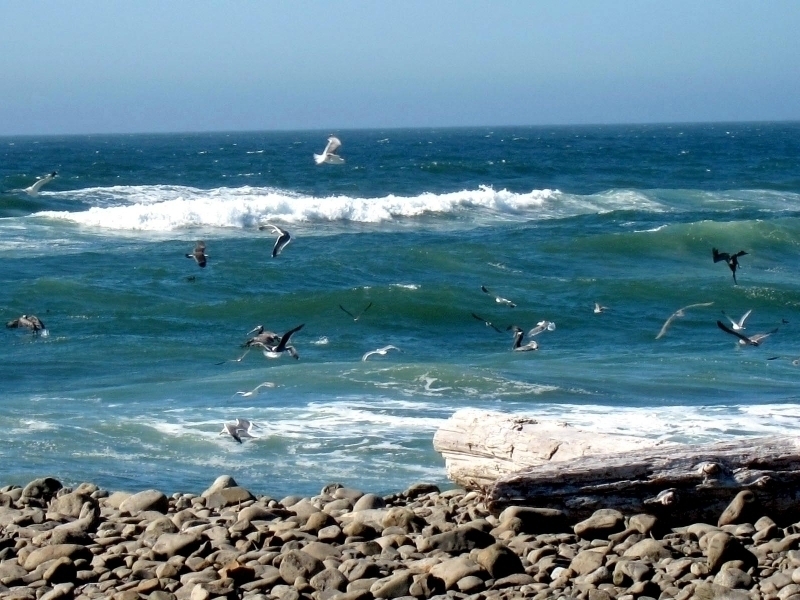 After hatching, the progress of the young depends on the location of the nest. 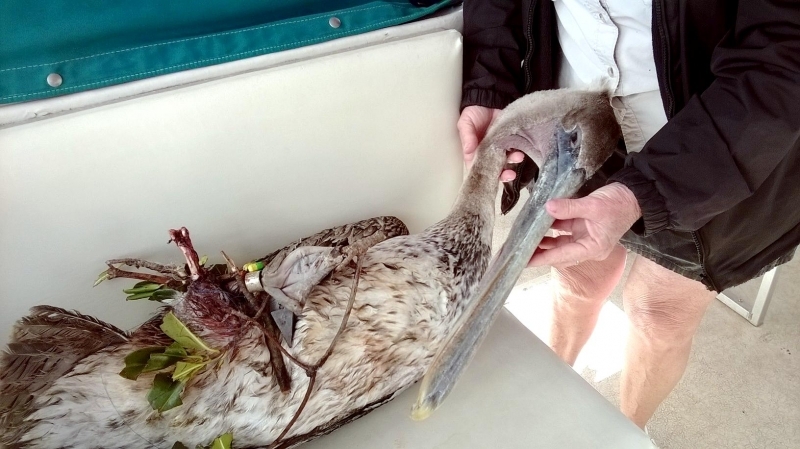 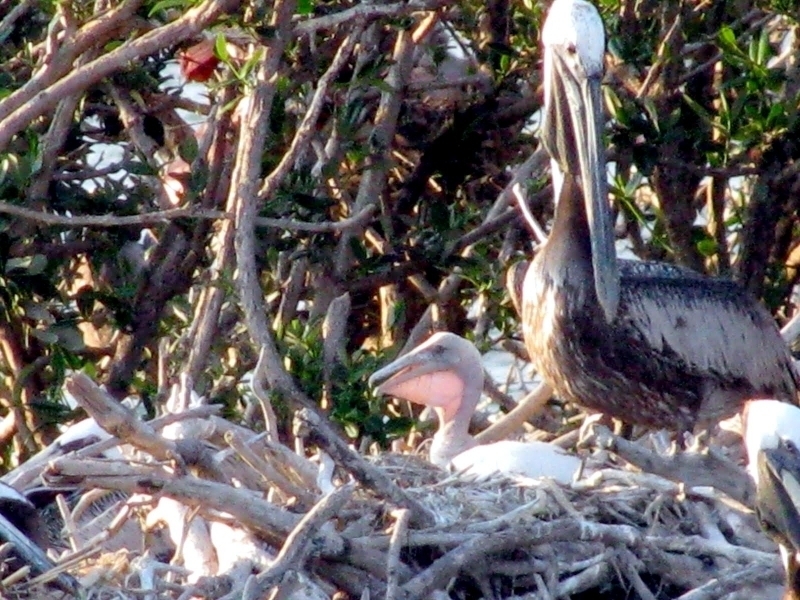 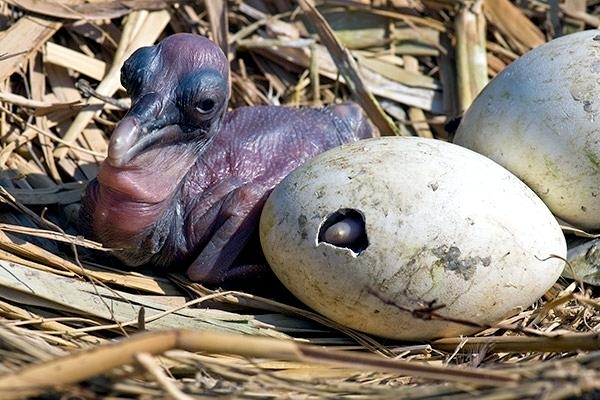 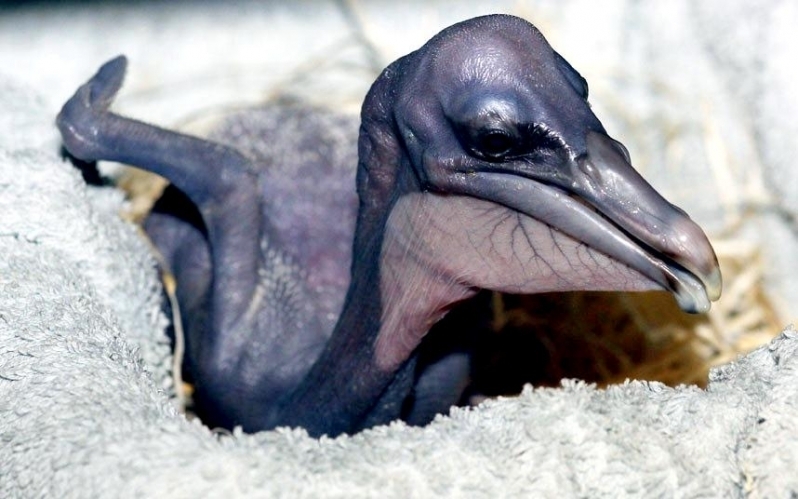 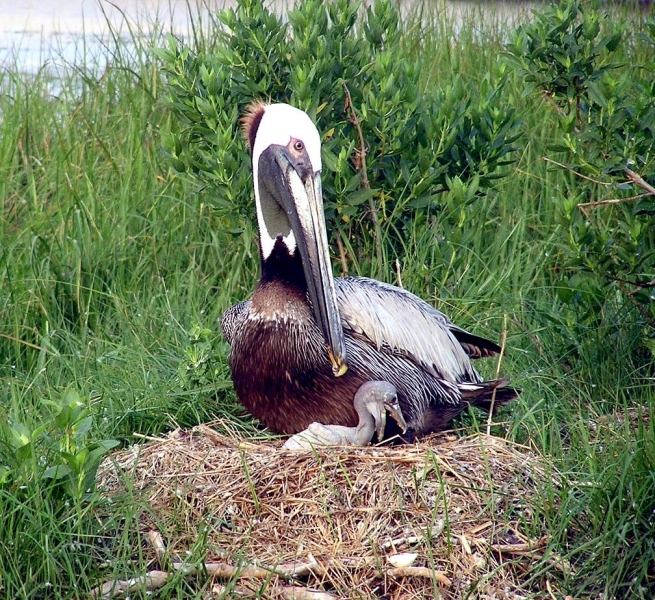 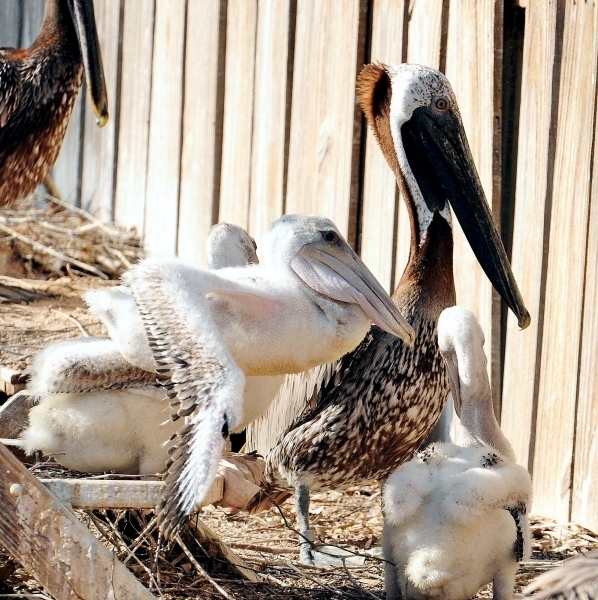 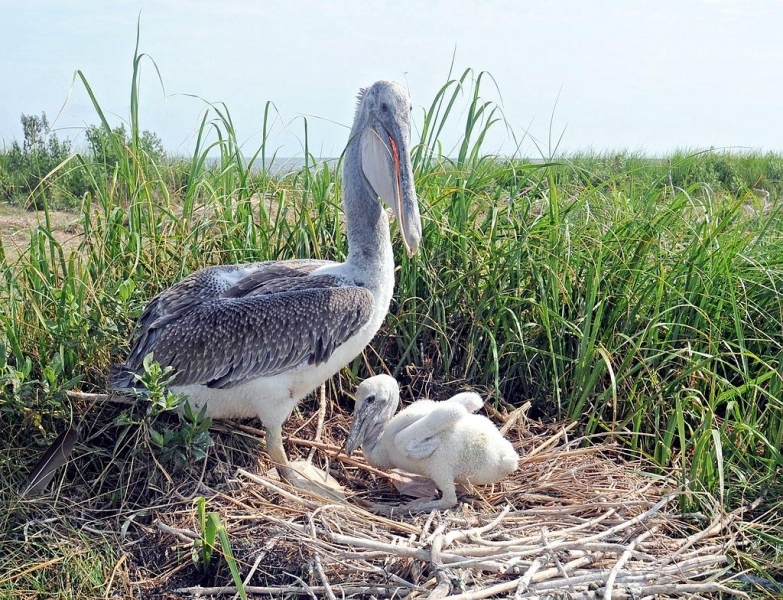 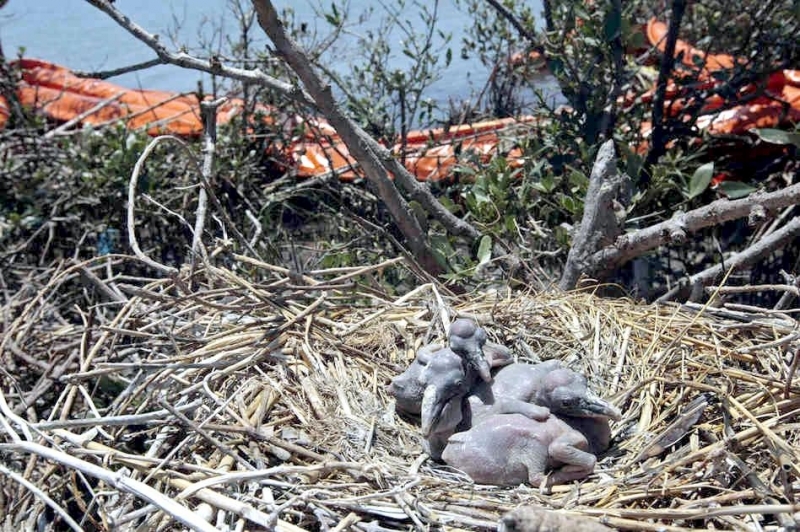 Brown Pelicans born in ground nests will leave after about a month; those in the treetops generally don’t venture out until 2 or even 3 months after hatching.